Hope everyones having a lovely weekend? Yesterday I bought 2 magazines - purely for the freebies on offer!! I got Marie Claire which came with a lovely hair treatment mask by James Brown London (Kate Moss hairstylist) worth £5- it smells gorgeous. I have seen these products before in Boots and I always wanted to try them so nows my chance! My hairs in really bad condition at the moment from over-dying and using too much heat so I'm hoping this will work a treat! I also got Instyle Mag which came with 2 Body Shop eyeliners, they came with a range of different colours (I got the colours shimmering steel and black). These are really good quality items and worth £7.50! Im tempted to pick up another magazine just to get 2 other colours as its a really good deal! So today I'm gonna put my feet up with a cuppa and have a read of my mags! 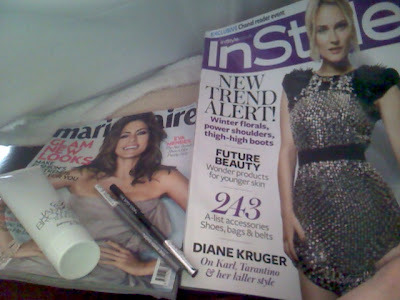 I would never normally by Instyle Mag to be honest - does anyone else buy mags purely for the freebies? can you do a review on these products please? the free stuff any good?